I have previously expounded upon the virtues of the new Mission Models acrylic paints and I demonstrated their use on a 1/72 Macchi Saetta; a scheme in a scale I would not have tried with any other paint. Mission paints are the easiest, most forgiving acrylic paints I've ever used-period. I was so impressed with their performance I became a dealer. My only complaint about this paint line was the lack of Luftwaffe colors. I say was, because that is no longer an issue. 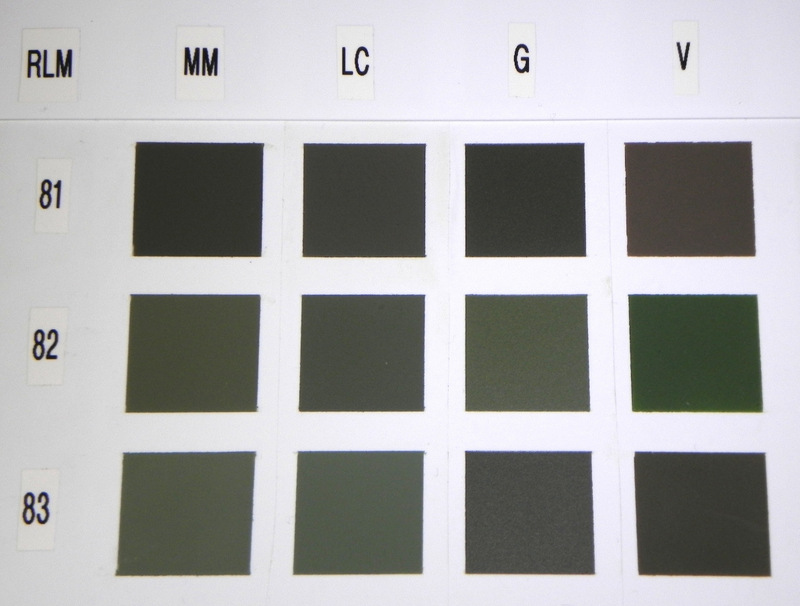 The new paints being added to the Mission line include RLM colors and, by extra-special decree from the Mission Models Grand Poobah Jon Tamkin, MPS has been provided samples. Given the gravity of the situation, the crew down in the secret underground Model Paint Solutions Research Laboratory (and bistro) were tasked with devising a simple way to assess how well these new Mission RLM colors stack up against the same colors from other paint lines; more on their methods below. Let it suffice to say that as a long-time Luftwaffe aircraft builder with a history of being picky about RLM color accuracy, I am very satisfied with the new Mission RLM colors: spot-on "accurate." Yup, that's right: "accurate." Being a WWII Luftwaffe/RAF kind of modeler I am painfully aware of the multitude of books, paint charts, blogs, arguments, and opinions regarding "accurate" RLM colors. Like many of you I have at least one book by Monogram, or Hitchcock and Merrick or Eagle Editions or Merrick, or Ullman (or? 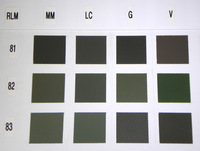 ), within which "accurate" RLM paint chips are provided. I leave you to your own musings as to which set(s) of standards is more "accurate" to you. I prefer a combination of multiple references and with that as my personal measure I like the LifeColor range. 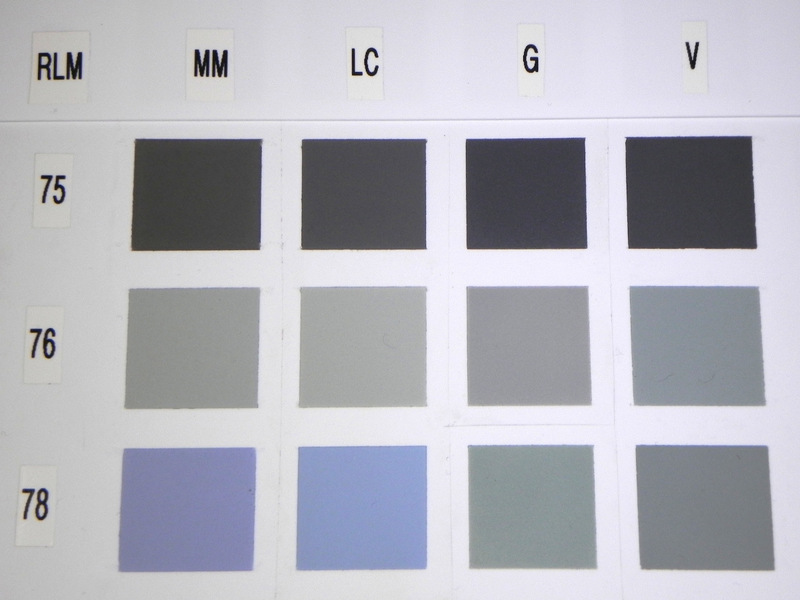 Lifecolor seems to capture the color and hue of most of the RLM colors better than other manufacturers. They have been my go-to acrylic paints for many years due in large part to the "accuracy" of the line. 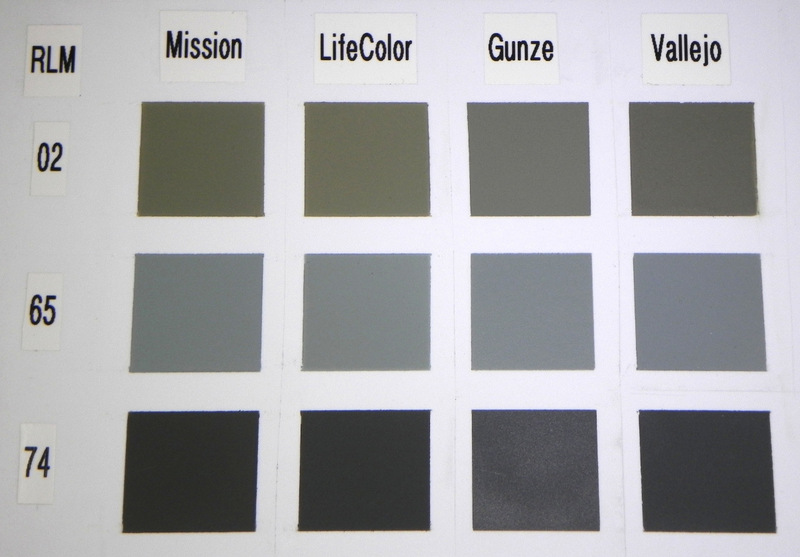 The Gunze Mr. Color range of RLM paints is my second choice; but they are sometimes hard to find and lacquer based. 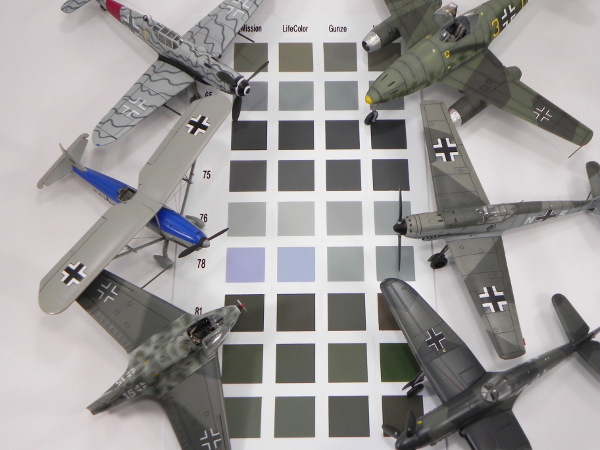 The aim of this little project is to show the color and hue of the new Mission Models Luftwaffe colors relative to the same colors from other manufacturers. I emphasize relative because of the infinite number of variables involved in photographing, publishing, and viewing color images online. With this in mind, I don't suggest using any of the images in this (or any) online article as a source of "accurate" paint colors. What I hope you can appreciate in this piece is how these paints compare relative to one another. To compare paints, I sprayed each color onto a ~1.8cm2 square area of white polystyrene, masked off on a grid of identically sized squares. To ensure as much paint opacity as possible, each color was applied first as a dry coat followed by a wet coat. I used the same airbrush, an H&S Evolution with a 0.2mm tip, to spray all the squares. I cleaned the airbrush completely between each color. Yes, the grid took quite a while to shoot. The crew in the underground lab was kept rather busy. When complete, I removed the tape and any paint that had wicked under the mask was scraped off with an X-Acto blade producing equally sized and spaced squares. Whew. A quick glance at the chart reveals that all four lines show a fair amount of similarity for all the colors tested. Of the four, the line that to my eye showed the most deviation from the other three was Vallejo. The Mission Models range tracked quite closely to the LifeColor RLM colors. Given my previously stated bias for this range of RLM paints, I couldn't be happier. 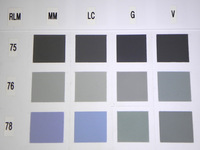 In general, Mission Models, Gunze, and LifeColor were in agreement on most of the RLM colors. Moreover, if we assume the old RLM-82/83 reversal for the Gunze paints, the agreement is even closer. Table 1: Catalog numbers of the Mission Models, LifeColor, Gunze, and Vallejo paints used in this study. Mission Model paints have taken many in the modeling world by surprise. Modelers with previous experience with acrylic paints marvel at how differently Mission paints behave: less airbrush tip-dry, less overspray, no clogging, and a tough, scratch-resistant finish. I've received emails from even long-time enamel and lacquer users that have switched to the Mission line after giving them a try. Not only are Mission Models paints the easiest most forgiving paint I've ever used, they're also about as "accurate" as the corresponding LifeColor paints. For me this is truly the best of both worlds. In addition to the RLM colors presented here RLM 66, 70 and 71 are in the works. A complete listing of the new Mission Models colors due in May is provided below. If you're tired of fighting with your airbrush and want to enjoy painting with a forgiving accurate paint, give Mission Models a try. For additional information on Mission Paints and other build articles by John check out his site Model Paint Solutions (https://modelpaintsol.com).